Missed the MMP Pre-order?!? You can still order it through us at pre-order price and as always, shipping is free. 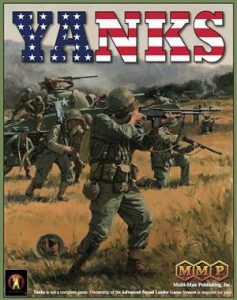 After years of waiting, Yanks 2 is finally out. MMP is currently shipping to pre-orders, then to the retailers (including us) and finally will be available for retail purchase through their website. Even though MMP has stopped selling Yanks 2 at the pre-order price, we are extending the special until we receive our stock order and as always, shipping is included in the price. Click on the Yanks image above to order your copy. Counter art. Yanks 2 has the newer easier to read/larger font counter information. Map boards. Yanks 2 includes 8 mapboards instead of 4. Maps 24,40,41,46 were not available in the original version. Yanks 2 mapboards are in the new Starter Kit format. Scenarios. 41 scenarios in Yanks 2 vs. 8 in Yanks. This is good news as I am getting bored of replaying the other 4,872 scenarios in the system. Seriously though, Some of these scenarios are updated from long out of print magazines and packs. Countersheets. 6 vs 5. One extra counter sheet may not be significant to you but when Oli has to clip all 10 copies he will be buying, it makes a huge difference. Handy-Dandy box with new box art from Ken Smith. While artistically impressive, get out of the friggin’ open ground you morons. Have we learned nothing in the 29 years since the original came out? 7. Chapter H. New entries that bring the U.S. up to date with all the changes of the past 3 decades. 8. Not out of print. This is clearly the most important difference between the two editions. Let’s hope this one stays on the shelves for many many years to come. October 2nd thru 9th. Ritterkrieg will be there with everything on sale. Unfortunately, the sniper cards will not be released in time. -John Dober is needing a roommate for ASLOK. His preference is for a blond in her 30’s but will consider all other applicants. Find him on Facebook in the ASL group or contact me for his contact info. -New ASL replay video. Tim defends the Tractor Works while his hordes of 5-2-7’s human wave to their rescue.